Autumn in my garden is very small and simple. Three Maples and four Dogwood trees are going red. Two elms and my one Willow tree are going yellow. So I've been out in search of autumn on a larger scale - Big Sky Autumn, at the local Christchurch Botanic Gardens. The Moosey garden has a pair of ducks. 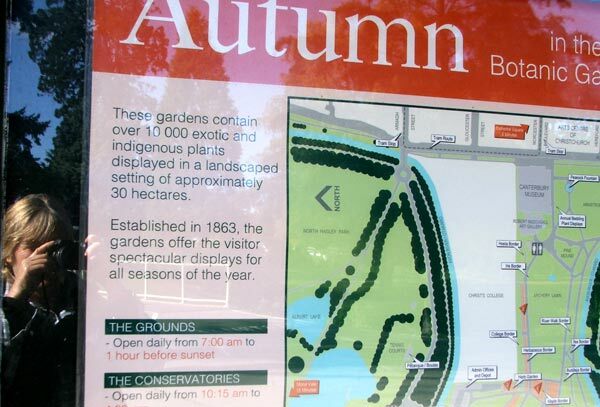 The Botanic Gardens has hundreds! It's the start of the official duck shooting season, so many extra local ducks are taking temporary refuge. 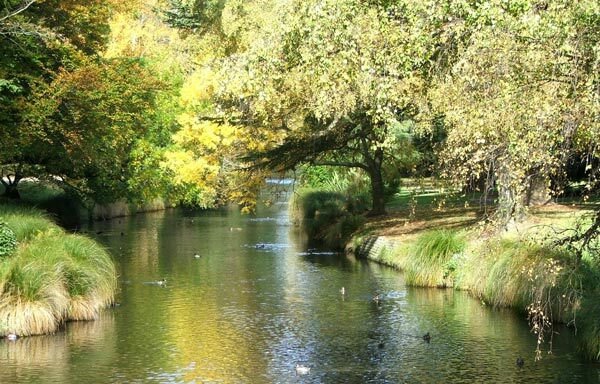 The Avon river and the large Botanic Garden ponds provide quacking, preening, and swimming space for all. 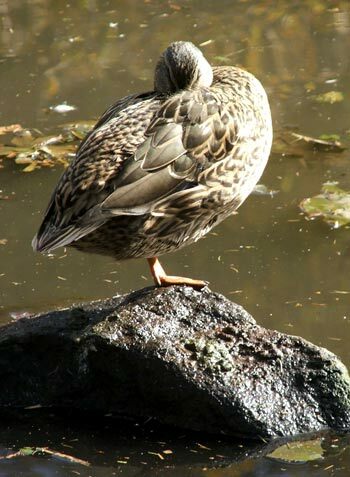 I know that ducks aren't strictly autumn, though, so I resist taking too many duck-on-rock photographs. They are snoozing on all the paths, and I nearly trip over one. There's obviously quite a lot of autumn scruffiness in the gardens at this time of the year. The Gunnera leaves by the ponds are ragged, and the rock garden looks dull and a little weedy. Many of the marginal pond plants are dying off. I ignore the rows of dahlias (nearly frosted) and hydrangeas (oddly colourless). I am here for positive autumn inspiration only! And, as I require autumn to be amplified, I'm going to start looking up to the sky (oops- nearly tripped over another snoozing duck). An autumn leaf-carpeted path leads me to the modern rose garden, where I spot some very scruffy pinky-red roses called City of Christchurch. The roses (and the city) suffered a huge hailstorm some days ago - poor things! The rose garden, like my own, still has plants intermittently blooming. Roses are tough garden customers, anyway - they wouldn't care about the hail! I take photographs of City of Christchurch, but decide pock-marked roses are not quite the visual ambience I came here for. The famous perennial border naturally looks out of sorts - it is after all quite late in the autumn season. The shrubby Salvias are still going strong, but they are keeping scruffy company. Flowering chrysanthemums have obviously been pounded by the recent hail, and there are large areas of already-trimmed stalks. A chunky clump of beautiful Bengal Tiger Canna lilies survives, but the autumn colours (green and gold stripes) on the leaves look oddly artificial. The soft gold flower colours is nice. 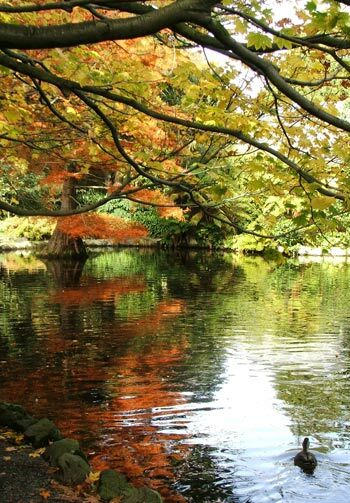 Autumn tree colours reflecting in the rippling water start catching my eye. A few resident ducks float into the frame, and then snap! This is grand scale autumn with grand scale ambience. Just perfect! 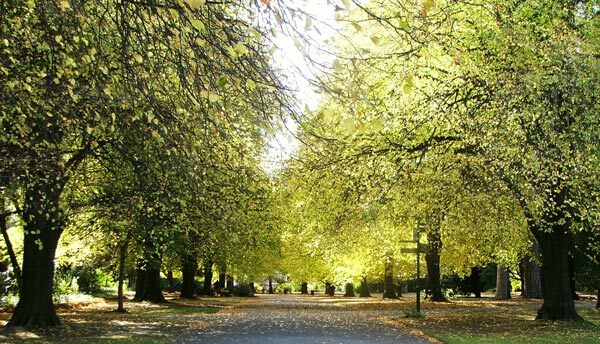 There are lots and lots of English deciduous trees like Oaks and Elms, and on the day I visit there's a faint golden glow everywhere. Piles of raked-up brownish oak leaves wait on nearly every lawn. Everywhere I look I seem to see Oak trees. A group of olive-clad gum-booted workers (possibly volunteers) watch me take photographs of a pile of raked up oak leaves. They see me as a crazy tourist, shake their heads, and shuffle off down a wide avenue of trees.